Born in Perth on 9th March 1844, Edward Albert was son of George Frederick Stone and Charlotte Whitfield. As a young boy, he spent many hours catching "giligies" at the swamp which was later drained to become the site for the Perth Railway Station. He was educated at Chigwell, Essex, England and returned to Perth in 1860 to become Clerk to the Attorney General. "In that position he qualified for the legal profession, and in 1865 he was called to the Western Australian Bar, entering into partnership with Mr. (now the Honourable) Septimus Burt."Battye. In 1861 he married Susan Shenton (1.6.1847 - 9.2.1922), the daughter of George Shenton and Annie Catherine Cousins. They had three sons and seven daughters. From 1870 until 1874 he was the Clerk to the Legislative Council. From 1880 until he was appointed Crown Solicitor in 1882, he was a nominee member of the Legislative Council. In 1884 he was appointed the Puisne Judge of the Supreme Court of Western Australia by the Colonial Office. It is said that this was the last civil appointment made by the Colonial Office in Australia. Edward Stone was appointed Chief Justice of Western Australia in 1901. He retained that position he until he resigned in 1906 due to concerns with his health. He was knighted in 1902. On a later occasion, when I visited Geraldton as a puisne judge to hold circuit court, a tribal murder case came up for judgement. The court was held in a little building near the original jetty. The late Mr Bob Skinner - since killed on active service - was my associate. There was a most abominable stench in the court, and I told Mr Skinner I could sit there no longer unless the nuisance was removed whatever it might be. Mr Skinner replied: "Please your Honor [sic], they have the native's remains in a bag under my table." Presumably the corpse of the dead blackfellow had been brought along on the same principle as the half brick is produced in an assault case. At any rate both the remains and accused were soon disposed of, the latter being acquitted on some technical point. Edward Albert Stone served as Administrator of the State on five occasions. In appreciation for his services to Western Australia, he was appointed Lieutenant Governor by the Crown in 1906. 23 April to 23 May 1909, between the departure Admiral Sir Frederick Bedford and the arrival of Sir Gerald Strickland. 4 March to 16 March 1913, between the departure of Sir Gerald Strickland and the arrival of Major-General Sir Harry Barron. E.A. Stone served on many committees. He was the first President of the Victorian Institute for the Blind, holding that office from 1897 until 1920. 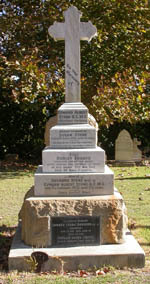 He was a member of the Committee of the Public Library of Western Australia, and of the committee managing the Western Australian Museum and Art Gallery. In 1911, he became a Trustee of a new body which was known as the Public Library, Museum and Art Gallery of Western Australia, assuming the role of Chairman in 1916, a position he held until 1920. In the year mentioned , Sir Winthrop [Hackett], then in the Eastern States, was commissioned by the Premier, Sir John Forrest, to visit the various Zoo Gardens, study their outlay and select a suitable man to plan and develop the proposed gardens at South Perth. His choice fell on Col E.A. Le Souef, then employed as assistant to his father, the Director of the Melbourne Institution. A Committee of Management was formed consisting of the Hon J.W. Hackett, M.L.C., His Honour Mr Justice Stone, G Throssell, Esq M.L.A. and Wm Paterson, Esq., Hon J.W. Hackett being Chairman. Col Le Souef was duly appointed, and the formation of the gardens on the ground already being selected, was begun on a modest scale. 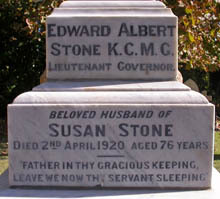 The Honourable Sir Edward Albert Stone died on the 2nd April 1920 and was buried at Karrakatta Cemetery. Stone Street in West Perth was named after him. The street disappeared with the construction of the Mitchell Freeway. Battye, J S (ed) (1912) The Cyclopedia of Western Australia Perth Cyclopedia Co.
Black, David & Boton, Geoffrey (1990) Biographical Register of Members of the Parliament of Western Australia Vol 1 1870-1930 Western Austalian Parliamentary History Project. Perth. The Handbook of the Zoological And Botanical Gardens, South Perth, Western Australia. Government Printer. n.d.
Stone, E A (1918) Some old-time memories: being the personal reminiscences of Sir Edward Stone, KCMG Lieutenant-Governor of Western Australia.Melbourne.